We are engaged in offering a wide range of Heavy Duty Tower Bolt. In accordance with the set industry standards, the provided tower bolt is precisely manufactured using high grade stainless steel and advanced technology. Owing to its anti corrosive and easy installation features, this tower bolt is widely appreciated by our precious clients. Moreover, to ensure the best quality, the offered tower bolt is strictly tested by our quality experts on several quality parameters. 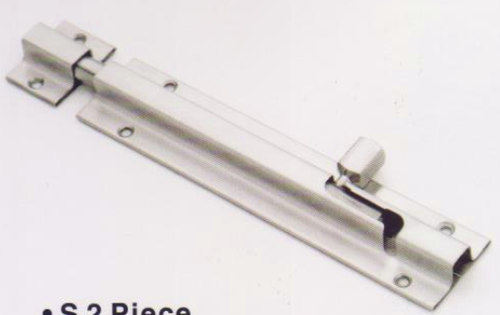 Established in the year 2003 at Ahmedabad (Gujarat, India), we "Redigtn Door Devices Steel, India" are a Sole Proprietorship firm that is recognized name occupied for manufacturing, exporting and supplying a wide range of Stainless Steel Aldrops, Stainless Steel Tadi, Stainless Steel Door Handles, Stainless Steel Tower Bolt, Stainless Steel Latches, etc. Our robust and innovative infrastructural base comprises various sub-functional units such as Procurement unit, Production unit, Quality Testing unit, Research & Development unit, Warehousing & Packaging unit, Transport & Logistics unit, Sales & Marketing unit, etc. All these alienated sub-units are manned by our adroit and skilled professionals, who hold rich industrial experience and knowledge in their respective filed. This infrastructural unit is installed with innovative machines, tools and equipment to enhance the productivity. Owing to our ethical business polices and flexible payment modes, we have attain a commendable position in the market. We are Exporting our products in Sri Lanka, Bangladesh and Africa. We are trade our Products under reputed brands like March Gold and Milty Gold.